3-4月共同出刊的手足球生活雜誌, 迎接世足賽的到來, 一連串的手足球比賽即將出爐, 支持手足球運動, 先從欣賞3-4月的手足球生活雜誌開始吧! 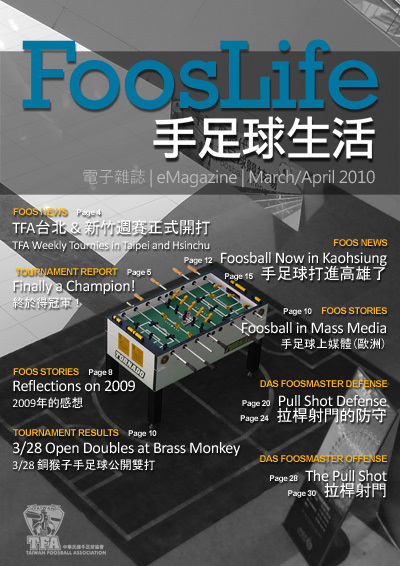 Welcome to the FoosLife, the Taiwan Foosball Association's monthly eMagazine. In the TFA's continued effort to promote foosball in Taiwan, FoosLife is brought to you to share foos stories and articles, and to bring players from all over closer together.